Somphai pah is a fruit from South East Asia. 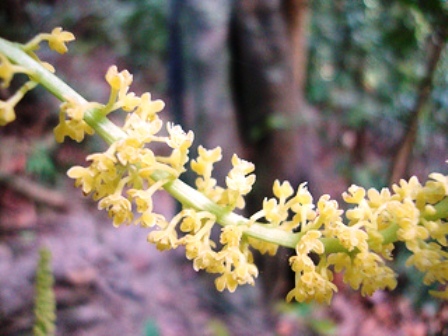 It mostly grows wild in the forests and village common lands in Peninsular Thailand, Peninsular Malaysia, Sumatra, Borneo etc. 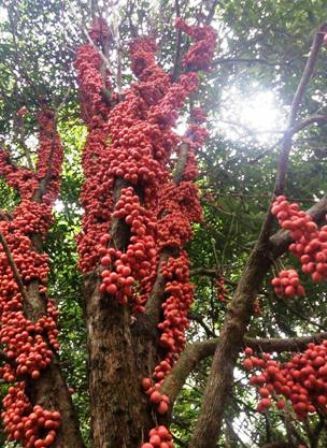 The tree is a very prolific bearer of attractive red fruits which are sweet and sour and taste. These are eaten by local people. Somphai pah trees are, however, rarely planted for their fruits. 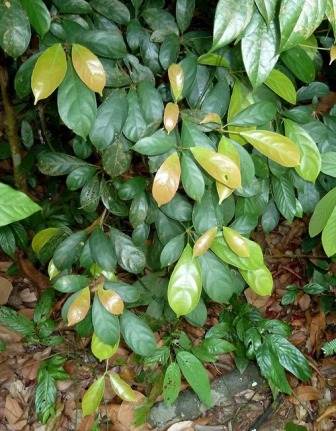 An evergreen shrub to tree 3-19 m high, dbh 4-21 cm; bark greenish-grey to grey-black to light yellow-brown to brown, 1.5-3.5 mm thick, rough to smooth, minutely fissured in strips 5 mm wide, papery; inner bark yellow to light brown. Leaves,elliptic to obovate, 5-23 by 2-9.5 cm, l/w ratio 1.6-3.7, papery; base attenuate to cuneate; apex acuminate, up to 22 mm long; upper surface glabrous, rarely hair-domatia present at base, rarely granulate, (dark) green when fresh, red to brown to green when dry; lower surface (sub)glabrous, raised glands absent, discoid glands sometimes present, (greyish to light-)green when fresh, red to brown to green when dry; secondary veins (3-)5-10 per side, closed at 2-3 mm from margin; nervation reticulate to weakly scalariform, green to yellowish to red when dry; young leaves whitish to pinkish. Staminate flowers 1-5 mm diam. ; pedicel 0.4-6 mm long, upper part 0.2-3 mm, sparsely to densely hairy; sepals 4 or 5, obovate, each with a different size and shape, 0.5-3 by 0.5-1.2 mm, densely hairy outside, glabrous to densely hairy inside, maroon to yellow outside, cream to yellow inside when fresh, whitish outside, brownish white inside when dry; stamens 5-7, 0.5-0.9 mm long, glabrous, cream; filaments 0.4-0.8 mm long, straight; anthers 0.2-0.3 by 0.1-0.2 by 0.1-0.2 mm; rudimentary disc sometimes present; pistillode obtriangular, 0.3-1.2 mm long, hirsute, hollow inside, cream; pistillate flowers 5-7.5 mm diam. ; sepals 4 or 5, narrowly elliptic to obovate, 2.7-8 by 0.9-2 mm, densely hairy outside, glabrous to densely hairy inside, white to yellow to usually red when fresh, caducous to persistent; ovary almost globose, with or without 6 wings, 1.3-2.2 by 1-2.3 mm, (2- or) 3- (or 4-)locular, velutinous, yellow; style 0-2 by c. 1 mm, densely hairy, yellow; stigmas 0.1-1.5 mm long, cleft apically only or up to base, caducous to persistent; lobes 0.2-1.4 mm long, glabrous with protuberances above, sparsely to densely hairy below. Fruits fusiform, 1-3-seeded berries, with or without 4-6 narrow wings, 16-32 by 7-15 mm, glabrous to sparsely hairy outside, raised glands present, dull red to maroon turning purple to black when fresh; pericarp c. 1-2.5 mm thick, glabrous on both sides; column 10-18 mm long, straight. Seeds ellipsoid, laterally flattened, 9-16 by 4-8 by 1-5 mm; arillode red to purple to white; cotyledons orbicular to square, membranous, 5.5-11 by 4-6 by 0.5-3.5 mm, radicle up to 1.5 mm long. 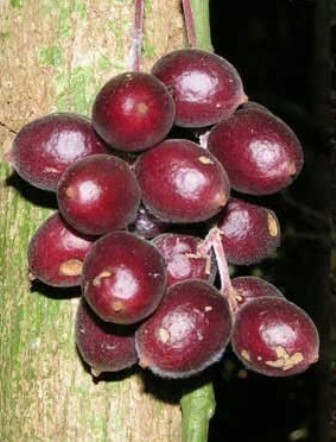 The fruits are edible and fondly eaten by local people. These are also cooked. Some people opine that the fruits taste better after cooking. The wood is hard and durable. It is used for making small utensils and as boxwood. New plants can be raised from seed. Fresh seed germinates in a few days.